Time: how will you work it in 2013? (Melting Clock available on ThinkGeek.com: http://www.thinkgeek.com/product/e7f1/?srp=1). Generally, I do well with meeting my goals (I don’t think of them as “resolutions”) for the year, even though they are usually large (if they’re too large, then I don’t give myself more than one). The goal I set at the beginning of 2009 was to land a writing residency. Mission accomplished: I applied to and was accepted at the Norman Mailer Writers’ Colony. 2010’s goal was to publish every short story I had in my drawer as well as build a better blog and website and actively engage in marketing. Missions accomplished: I placed/sold a record 22 pieces plus one new commission and a best-of selection, and I followed through on my website/marketing plan. 2011’s goals were to get my books in Cons and judge a contest. Missions accomplished: through the New England Horror Writers, I sold books at several events, among them Rock and Shock and the Enfield Zombie Walk; I was approached by New York City Midnight to judge their short story contests and, of course, took the position. 2012 got a little derailed. I hadn’t had time to think of a goal before our New Year’s Eve gathering, assuming I’d figure out what I wanted the first week in January. But then Nathan popped the question, so the goal for the year was throw a wedding on September 15. So what will be my goal for 2013? Recently, a close friend and I had a conversation about how we’ve both been so crazy-busy with marketing, events, and yes-ing everyone to death (on top of everything else in life) that we’re not writing (much less getting feedback on it and having consistent camaraderie with other active writers). Or reading. We fondly recalled the days we’d hole up in our home offices with music playing and candles lit for a whole weekend to just write. When we hung out and talked about writing for hours on end. When we sat around on, say, a Monday night and just read a whole book of short stories. Those anonymous days (2004, not that long ago)—when there was no social networking, not everyone had email, books were paper, cell phones were just phones and personal websites, let alone blogs, were unheard of—loomed in our memories like paradise. And it occurred to us both that we want that back. We want to enjoy life again reading, writing, and critiquing, instead of doing all sorts of other junk that on many days is drudgery. So this year, I decided my goal wouldn’t be so grand. It’s to simply do less and more. Less blogging/marketing/things I said yes to I dread, more writing, reading and critiquing. Fewer events, more time at home. Fewer new projects, more old ones. I’ll have more time to do what I like, which means that time will probably go even faster (gulp) than it does now. What are your goals for 2013? How will you make time work for you? 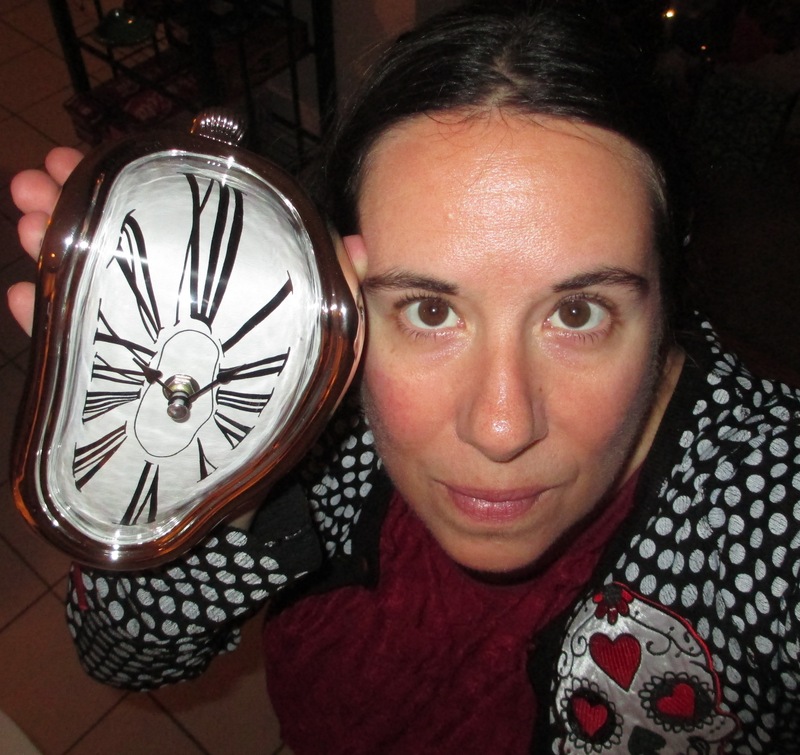 Posted on January 2, 2013, in Deep Thoughts & Fun Stuff, The Writing Life and tagged how to keep New Year’s Resolutions, making time for writing, New Year’s Resolutions, Persistence of Memory, Salvidor Dali melting clocks, ThinkGeek.com. Bookmark the permalink. 4 Comments. I love this piece. Less really is more. A friend of mine who is desperate to raise her three young kids said in her card this year: ” someone pointed out that we should stop trying so hard to make it simple.” Just let it be. That said, dammit: What are MY goals for this year. Hmmmmm- I’ll get back to you on that.